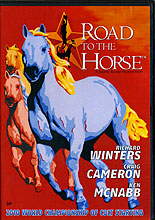 The legendary Road to the Horse, World Championship of Colt-Starting, is an event that has revolutionized entertainment and education within the equine industry. Capture the excitement of three clinicians training three colts in three hours, right from the comfort of your living room! Within this three-disc set you will get never-before-seen interviews with competitors Richard Winters, Craig Cameron and Ken McNabb along with every facet of the event from the opening ceremonies to the crowning of the 2010 World Championship of Colt-Starting. With behind-the-scenes footage and filming from every angle, award-winning producer Tootie Bland will make you feel like part of the Road to the Horse family. Whether you attended the event and want to remember the training techniques displayed or you'll be watching for the first time, this DVD will keep you on the edge of your seat.